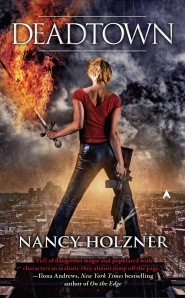 JH: Today we have a fun post from author Nancy Holzner for those who are like me (and Nancy apparently), and tend to write our dialogue first, and layer in the rest after. She does it differently than I do, and I found her technique interesting. Nancy and I also share a few other things, like a love of zombies and humor, often at the same time. If you enjoy fun urban fantasy with zombies (and a lot more, but the zombies are what makes me happy), go pick up Deadtown. Nancy is a full-time author. Besides urban fantasy and mystery novels, she writes how-to and reference books, mostly on tech-related subjects. For example, she's written four books for O’Reilly’s Missing Manual series. Most of her nonfiction is published under the name Nancy Conner. Writing a novel means wrestling, over and over again, with beginning. There’s the act of sitting down each day to write, of course, but that’s not what I’m talking about here. Each scene, each chapter—the novel itself—requires a beginning. When you’ve finished a scene, you have to figure out how to start the next one. My favorite way to get started on a new scene is to sketch out the characters’ dialogue. I bring together two or more characters who appear in the scene and see what they have to say to each other. Often, the first time through, I just write down their words, noting who’s speaking if necessary. This bare-bones dialogue looks kind of like a script. In case you’re wondering, qqq is my shorthand for “something’s needed here.” I use qqq because it’s easy to search for. Here, I stuck in a couple of qqq’s because there’s a pause in the dialogue where something happens—an action, a shift in the tone of voice—but right now I’m focused on the what the characters are saying. After I’ve sketched out some dialogue, I read back through the conversation and think about fleshing out the scene. Where are they? I know they’re in Gwen’s kitchen, but what are their positions? Is Maria’s throat-clearing “hi” necessary to open the conversation? How do the characters look and act as they speak? How do they feel about the situation? During the second pass, I think about these questions and start layering in the answers. Balancing the stack of plates, I shouldered open the swinging door into the kitchen. Maria, wearing blue flannel PJs, stared at the doorway with wide eyes. She’d half-risen from her seat and looked ready to bolt. When she saw it was me, she slumped back in her chair. “Okay.” She padded over to where I stood. Her bare feet looked cold on the tile floor. We worked for a minute or two in silence, Maria squinting seriously at each plate. “Bad dreams, huh?” I asked. You can see, I’m sure, what I’m trying to do in the second pass: Show Maria’s worry and ambivalence about her dreams and Vicky’s attempt to get her niece to speak freely. Loading the dishwasher gives them something to do as they talk, and Vicky uses it as a way to make Maria feel more normal. I’d go through a scene like this at least a couple more times before moving on—adding and subtracting, looking for places that need action or clarification or a hint about what the characters are feeling. Getting a sense of what they have to say to each other is the first step. Once I’ve got an idea of the dialogue, I can begin to picture what the characters are doing and thinking and feeling as they speak. It never fails me as a scene starter. This makes a lot of sense. One of my critique partners recently commented on my dialogue, and I think this will help me make it better. Thanks, Janice, for inviting me to write this post. It was instructive to pay attention to how I do things (instead of just charging in). Now I want to hear about Janice's technique. @chicleeblair I hope you find my technique helpful! It does help sometimes to shake things up from the way you normally approach them. Chicleeblair: That's great! I really liked Nancy's qqq tip. Nancy: Good to have you here today. I've found writing the blog really makes me examine how I do things. It's interesting to dig in and ask why. I was actually thinking about how I plan to use dialog to help with my Shifter 3 revisions tomorrow, so it'll be a fun companion piece to your post! Great suggestions. I never thought to just get the dialogue out first. I'll have to try it. That way, when I go back, I remember what I'd been going for. But it keeps me from spending ten minutes or more on a phrase that might get cut later. I also started using [lastname] when I hadn't figured out a character's last name yet, but it would have been said or referred to in that spot. One minor character is even referred to as Mr. Principal in my draft. Placeholders are wonderful things to keep the momentum going. this is one of those entries that i skimmed over but then stuck in my head to the point where I had to dig around to re-find it. i try to add context to my dialog as I'm writing, but i've found that i'm not doing it enough. i'll have to keep this idea in mind for my next draft zero. NIce post. Thanks for the tips about fleshing out scenes. I'm always leaving notes to myself in my WIP. I put them in caps and make them searchable so they don't get lost. Okay, that is really interesting. Thank you for posting this advice.